A well made stuffed pita sandwich has a delightful blend of flavors and textures. We stumbled on this mix of tastes by accident – simply it’s what we had around to eat! 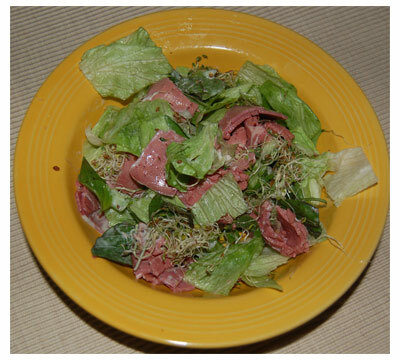 The flavors of the pastrami, Thai Basil and green onions mix to create a wonderful taste experience. 1 tbsp fresh Thai basil leaves, ripped into 3/8″ pieces. *Alfalfa sprouts aren’t required but add an intriguing crunch to the sandwich. The secret to making great pita sandwiches is to mix everything together first in a bowl and then stuff the mixture into the pita. If you try to make the pita by simply stuffing things into the pita pocket, you won’t be able to blend everything evenly. 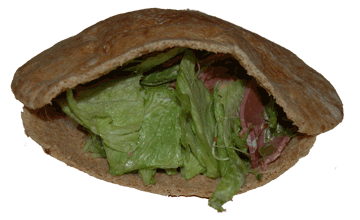 To make this pita pocket sandwich, cut the top 3/8″ off of a whole wheat pita across the widest part. Mix the ingredients listed above in a salad bowl, and then stuff into the pita pocket. If you’re like us, you often make too much of a good thing. That is, your eyes are bigger then your stomach, and you cook more food then you can eat. We don’t like wasting food, so when we made the Buffalo Chicken Thighs Recipe the other day, we had a few thighs left over. 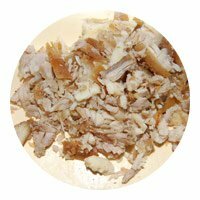 Since we used boneless skinless chicken thighs, they could easily be chopped up to make a chopped chicken sandwich. 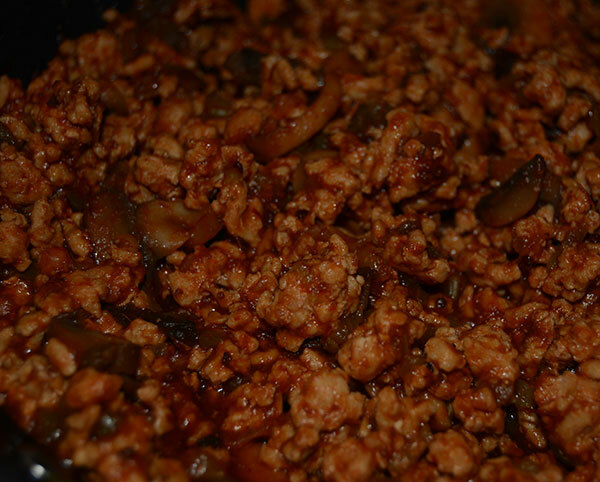 This is a really easy recipe to make using leftovers. Since the chicken was already cooked, all we needed to do to prepare this recipe was to chop up the seasoned chicken thighs into small pieces. We find cutting up chicken is easier when it’s cold, and so we chopped up the chicken right out of the refrigerator, then put it in a bowl to be reheated in the microwave. Since the Buffalo Chicken Thighs are very flavorful, this recipe doesn’t require any sauce. Serve the chopped Buffalo Chicken Thighs on submarine rolls that have been toasted lightly in the broiler, and then spread with mayonnaise. Top with the chopped chicken, and lettuce and tomato. This is a tasty sandwich, which could actually be prepared directly from the Buffalo Chicken Thighs as the main dish instead of as a way to use up the leftovers. Okay, it’s a week night. You just spent an hour in rush hour traffic. You want a simple, easy meal, that’s ready in a jiffy. 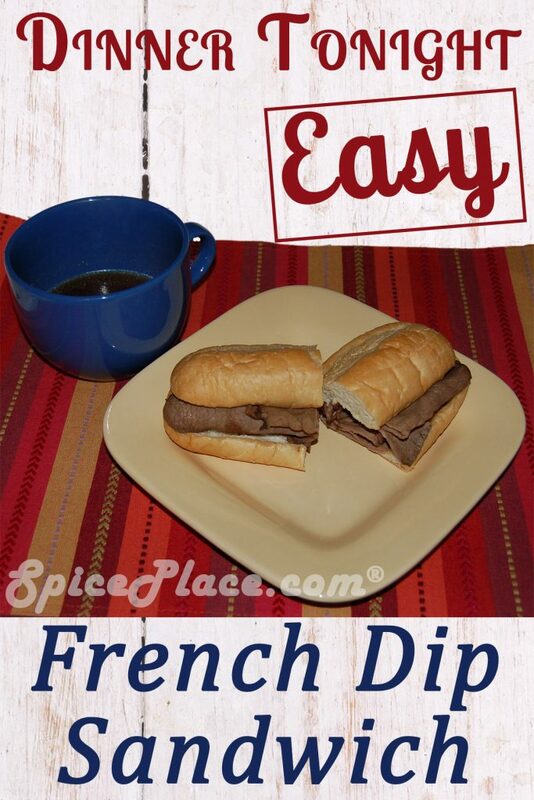 Our recommendation would be a French Dip Sandwich made with McCormick Au Jus mix. Of course, you’d need to have 3 items on hand: Au Jus gravy mix, sandwich rolls, and sliced beef. The French Dip Sandwich was created in the 1920’s in Los Angeles, California when a roll was accidently dropped in to the Au Jus gravy. The customer said it didn’t matter, and took the sandwich anyway. The next day they came back and asked for the same sandwich and thus was born an American classic sandwich. Don’t let the French name lead you on to the idea that this is a gourmet meal. It’s really just a roast beef sandwich served with a side bowl of Au Jus to dip the sandwich in. But it’s still a great sandwich and is loaded with flavor. Usually the French Dip Sandwich is served with a side of French Fries or French Fried Onion Rings. This is a recipe for French Dip Sandwiches that we’ve been making for ages. As we said in the lead paragraph, it’s really a great recipe for a busy week night. That’s because it’s easy to make, and tastes great. Make Au Jus gravy mix according to package directions. Add sliced beef to Au Jus gravy to heat the beef. Remove beef, and make sandwiches. Ladle 1/3 to 1/2 cup of Au Jus gravy into bowls to dip sandwiches in. McCormick’s Old Bay Salmon Classic makes great Salmon Cakes simple. McCormick’s blend of seasonings in Old Bay is always great with seafood. All you need to do is open up a can of salmon, mix in the Old Bay Salmon Classic and some mayonaisse, form the cakes, and then fry until crisp. It makes a simply delicious salmon cake in a jiffy. With Old Bay Salmon Classic, you can go from thinking about what to make for lunch, to eating a delicious salmon cake in just 10 minutes. Heat a 1 tbsp canola oil in a skillet. While oil is heating mix the salmon with the Old Bay Salmon Classic mix. Mix the mayonnaise into the salmon mixture. Make 4 large salmon patties. in the oil the oil is ready. Place the salmon cakes in the skillet. Cook about 2-3 minutes per side or until golden brown on both sides. 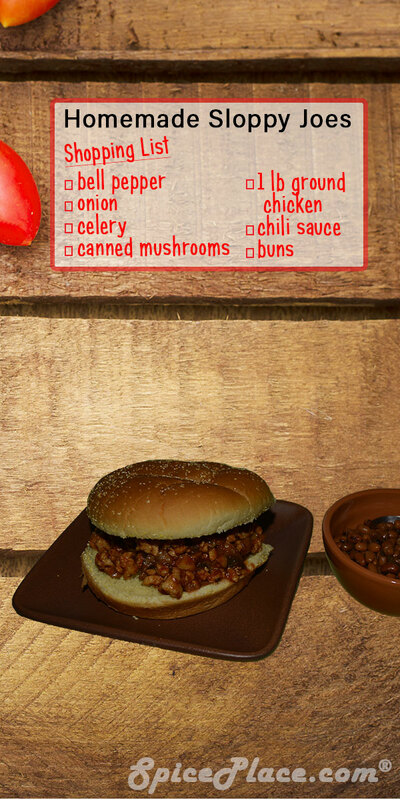 Can be served on a bun as a sandwich or by themselves. Serve with tarter sauce, and your favorite vegetable such as lima beans. 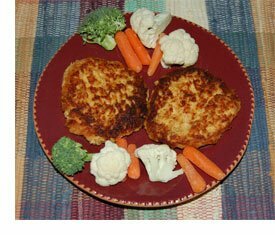 The Salmon Cakes can be broiled as well. If we ran a restaurant, there is one recipe that we’d offer on the menu and we know it would be a hit. Now, this isn’t a steak and cheese sandwich. 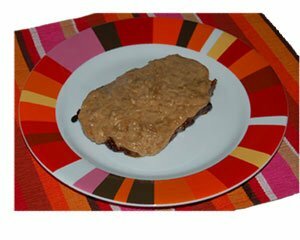 It’s a Rib Eye steak, broiled to medium well (or your desired doneness) and then topped with a sauce made with savory . It’s absolutely the best tasting steak we’ve ever had. To make this recipe, first prepare the cheese sauce (recipe below). Then broil a Rib Eye steak seasoned only with salt and pepper until the desired doneness is reached. Remove the steak from the broiler, top with the cheese sauce, and serve. Yum! Any left over cheese sauce can be frozen and thawed when needed.